Th e village of Maentwrog, beside the road from Ffestiniog to Porthmadog is a place of steep steps and slopes, a village where, in places, it seems that you look out at your neighbour’s house at chimney level. This topography must have helped sixth century St Twrog who, it is claimed, once launched a massive boulder from the top of Moelwyn, a hill to the north of the village, neatly crushing a pagan altar in the valley below, close to where he built his church. 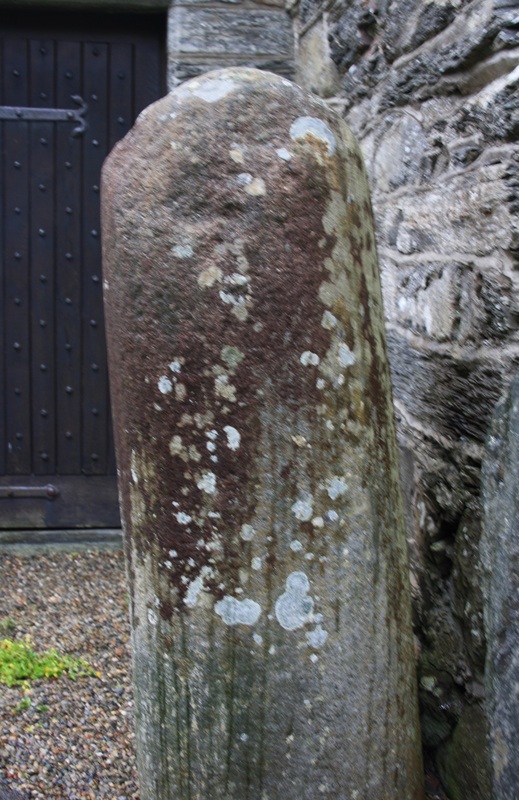 This stone remains in place beside the church and gives the village its name – Maen Twrog – Twrog’s stone. Twrog we find in Lives of the British Saints, he may be the brother of saints Trillo, Lechid and Tegai, all of whom we have come across as having been active in the local area, Wells dedicated to Trillo and Llechid we have visited previously. Twrog was possibly a disciple of Beuno at Clynnog and is reputed to have written the long lost Book of St Beuno which once lay in Clynnog church. Twrog himself has two churches dedicated in his name in Llandwrog and Bodwrog. His feast day is celebrated on June 26th. The present church in Maentwrog, dating from the early nineteenth century,and having been extended and improved in the 1890s is not dedicated to Twrog, instead it is St Mary’s.. Some sources do suggest that previously the local church was dedicated to St Twrog, The well too carries the name Ffynnon Fair, St Mary’s Well. Although the information sheet provided in the church informs the visitor that St Mary’s Well can be seen in the village, it gives no indication at all as to how and where to find it. Fortunately we were forearmed with a route and climbing the steep steps opposite the church, turning right at the top in front of a row of cottages and then bearing left up towards another terrace we soon reached Ffynnon Fair. It lies around 80 yards to the south east of the church on a sloping hillside immediately north of this second terraced row, again the name gives it away, Bron Fair. 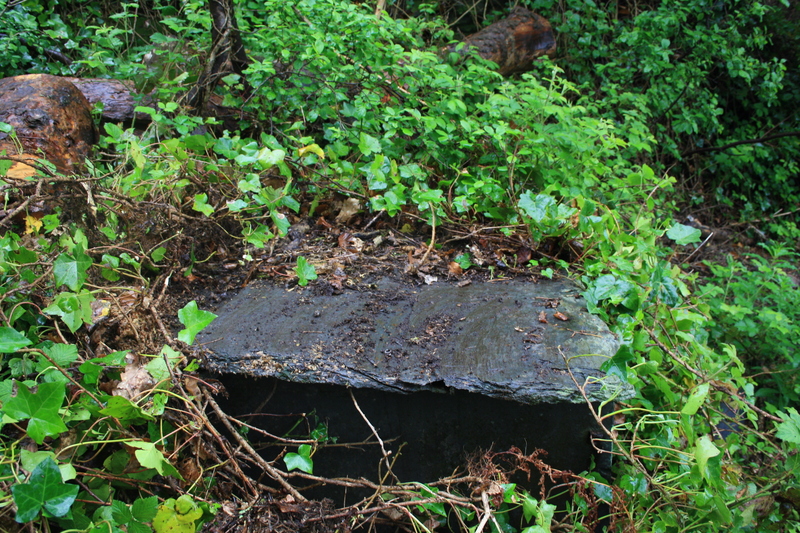 The spring itself is enclosed in a slate tank, some three feet high, three feet deep and around two feet wide. 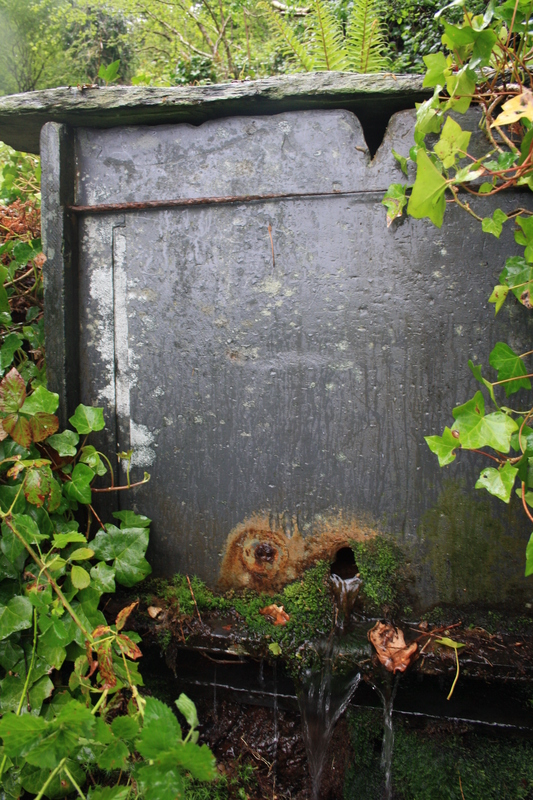 From the front water flows, or leaks into a concrete gully and down into a drain. When we visited the tank was almost covered in ivy and brambles, and if we had not known what we were looking for we could have easily passed it by. This housing would appear not to have changed in over 100 years, since the description provided by the Royal Commission when they visited in 1914 to compile its Inventory of the Ancient Monuments in Merioneth matches exactly what we see today. They stated that the spring is used as a water supply for the neighbouring houses, so we may suppose the slate tank was constructed at the same time as the terrace in the nineteenth century. Apart from its name, nothing seems to mark it out as a particularly special site. I have found no account regarding any particular customs practised at the well or of any special properties of the water. 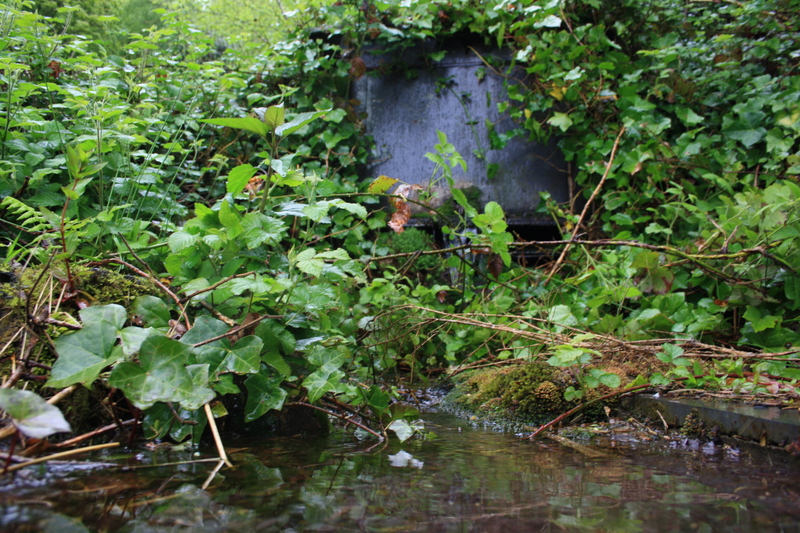 Clearly this is the holy well of Maentwrog, but beyond its name all history has been lost. I hadn’t realised there was a well here. I stopped by at the church to look at the stone some years ago.